Clive Owen in Steven Soderbergh’s TV series, The Knick, reviewed. Steven Soderbergh’s medical drama looks better than anything on TV, but otherwise resembles every medical drama on TV. Clive Owen in The Knick. Steven Soderbergh’s new TV series, the medical period drama The Knick, seems like it should be proof of détente in the bogus yet heated conflict between television and movies. Soderbergh, a film director who in recent years has had some very complimentary things to say about television, is, no fuss no muss, making television, and he has even drafted a movie star to help him do so. Forget TV vs. film—what we have here is a co-mingling, TV and film trading ideas, influence, and talent. The Knick, which begins Friday night on Cinemax, is supremely, impressively attentive to aesthetic questions that television often ignores. * Simultaneously, it is indifferent to advancing long-running TV themes, conversations, and ideas. It is, as an aesthetic object, outstanding; as a medical drama, satisfying; and, as a piece of art, totally disappointing. It is as if a Michelin-starred chef entered a contest for pineapple upside down cake and expected to win even though his flour-to-butter ratio was all messed up, just because his cake was beautifully, perfectly assembled. Imagine what the guy could have done if he cared what pineapple upside down cake actually tasted like. The Knick stars Clive Owen as Dr. John W. Thackery, a surgeon working at New York City’s Knickerbocker hospital in 1900, the bloody, gruesome dawn of modern medicine. In addition to being brilliant and innovative, Thackery is a hopeless cocaine addict who takes the edge off long days at opium dens. He is also a racist. The Knick has taken Dr. Gregory House, the gifted, ill-mannered, undeniably alluring, pill-popping physician of Fox’s House, turned him into Clive Owen, and plopped him into a time machine headed for 100 years in the past and the outskirts of premium cable. There are many TV series still trying to wring insight and pathos out of the very well-wrung antihero. But there is something almost insolent about The Knick’s approach to this cliché, and how little care it takes to advance it, while simultaneously expending so much energy to advance other more classically cinematic concerns. A kind interpretation might be: Soderbergh thinks the antihero trope is so effective, all it really needs is to look much, much better, which, after all, is his purview as both director and cinematographer. But that’s a very unsophisticated understanding of the antihero from a director, who, in his movies anyway, has a very sophisticated handle on archetype and genre. The Knick seems unmoved by the very thing that makes television television: the long, revelatory play of story and character. If, as the saying goes, movies are a director’s medium and TV is a writer’s one, it feels as though Soderbergh thinks he can change that just by being Soderbergh. He almost pulls it off. The camera shoots from noticeably low angles, suggesting just how close to the ground—the filth, the murk, and its origins—modern medicine and its practioners are. The blacks and whites—the hank of Owen’s hair, the white of his sleek leather shoes—are crisp and clear while the other colors are leached if not downright absent. Against this palette, the few colors there are—a blue bicycle, and, more importantly, all that dark, red blood—jump out. The blood gets further showcase in the nauseating, brilliantly directed scenes in the operating theater. In the pilot, Thackery and his mentor, Dr. Christenson (Matt Frewer), the man who introduced him to cocaine—indeed, the two shoot up before surgery together—prepare to operate on yet another case of placenta previa. All their previous attempts have resulted in the death of mother and child, but they keep trying to better their method and the outcome. Showily talking to the assembled spectators—it really is a theater—they slice into the woman, and blood begins to flow in ever-increasing torrents. Medical dramas often show you flashes of blood and guts as a kind of gross-out thrill. Here the blood isn’t funny, it isn’t lurid, it isn’t just red. It collects in bottles, the terrifying volume of surging life a horrifying reminder of what is really at stake, of how bodies are bags of blood—of how close surgery can be to slaughter, an operating room an abattoir. All the care that Soderbergh has taken with the colors, the camera, the blood—all his masterfully deployed aesthetic choices—stand in stark contrast to the care taken with the scripts. (The Knick is written by Jack Amiel and Michael Begler, whose previous credits include the Kate Hudson film Raising Helen.) Nothing in the story other than those nearly wordless operating scenes comes close to illustrating the tension between innovation and death. Thackery’s drug addiction is presumably meant to illuminate the same tension: medicine, which cocaine was at the time, as poison. But The Knick gives addiction a very glamorous cast. Cocaine is essential to Thackery’s energy, his ability to go on for hours and hours, and yet it does not seem to interfere with his skills. He may have blown out all of his veins, but his hands are supremely steady. Even high out of his mind, and in the company of two naked women, he makes medical breakthroughs. His addiction makes him alluring and mysterious, especially to a young, watchful nurse (a very good Eve Hewson, daughter of Bono), who finds him going through withdrawal in the pilot and is drawn to him like a gorgeous young woman to a middle-aged head case—the moth to the flame, unfortunately, of both TV and film. As the series begins, a black, Harvard-educated surgeon, Dr. Algernon Edwards (Andre Holland), joins the staff of the hospital at the insistence of the head of the board, Cornelia Robertson (Juliet Rylance) and her father. Dr. Edwards grew up in their home, the son of their maid and chauffeur. Edwards, like Thackery, is a surgical genius with no small ego, but Thackery treats him abhorrently, all but refusing to work with him. Edwards responds to being shut out of his calling by opening a secret clinic, which he largely funds himself, in the basement. When it is inevitably discovered by Thackery, as Emily Nussbaum put it in her New Yorker review, “game recognizes game.” Thackery not only agrees to work with Edwards, by the next episode he is running out into the street to stop a black man from being beaten in a race riot, permitting black people into his hospital, and working endless hours to help them in an emergency, his unrepentant racism apparently not so unrepentant after all. The Knick, like so many medical procedurals, can be gripping, but gripping in the way of other less handsome, less credentialed, totally enjoyable series, from ER to House to Grey’s Anatomy. 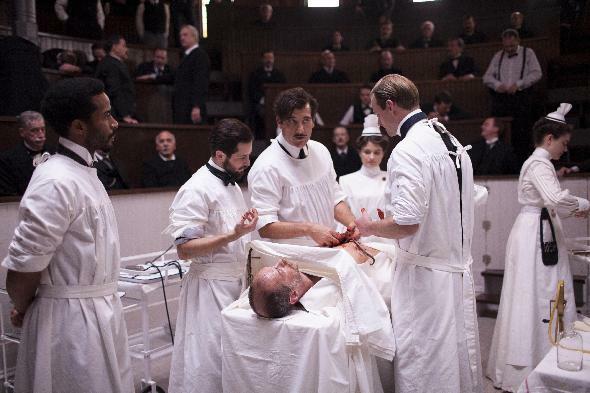 The Knick’s historical element adds curiosity—all those surgeries with bare hands! All those noses destroyed by syphilis!—and the show’s pedigree and look give it a tony patina, but the predictable (if satisfying) beats are still numerous. It may be 1900, but there is still occasion for a doctor to perform that old standby, the emergency tracheotomy. Physicians’ loved ones are still taken ill at a rate disproportionate to the regular population. Near-miracles happen. Staffers sleep around. And an antihero physician still knows how to heal everyone but himself.